BETA Pet Maintenance With Chicken is a nutritionally balanced diet for all breeds and is recommended for dogs with reduced activity levels which are over 1 years old. The food is specially formulated by vets and pet nutritionists to provide a wholesome, balanced diet to help keep your dogs in peak condition and health. 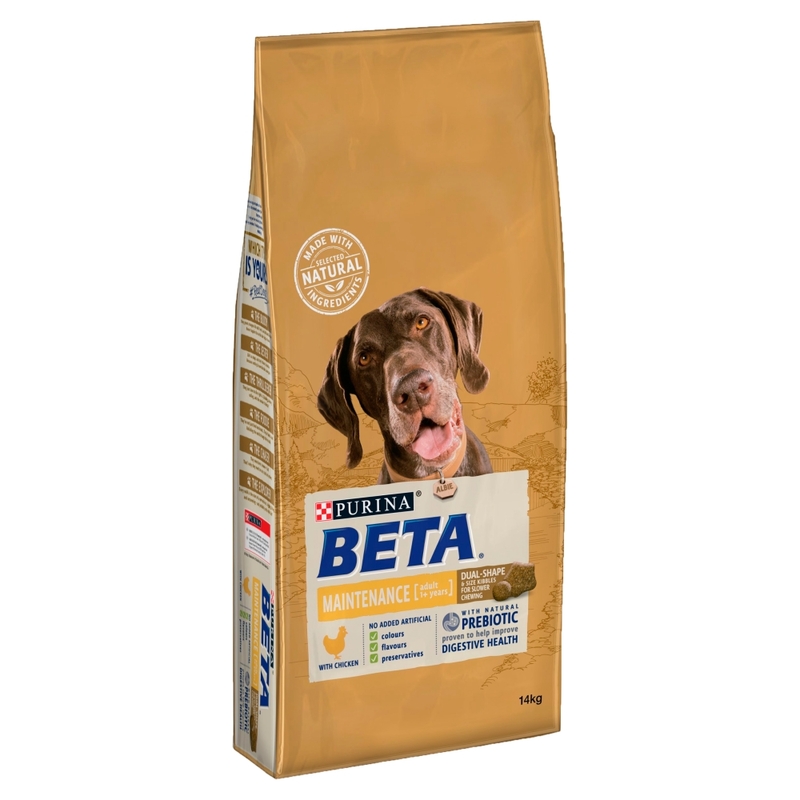 BETA Pet Maintenance combines a palatable, tailored blend of proteins, fat and vitamins to promote healthy internal systems and strengthen your dog's natural immunity. The formulated blend of fibrous whole grains and prebiotics will aid digestion and encourage regular stools, reducing digestive discomfort. With a lower fat content than standard BETA Adult diets, BETA Maintenance meets the needs of a less active or non-working dog. Please note: This product will no longer be available once current stocks are sold. We Suggest Beta Adult or Beta Working Dog (depending on breed). Nutritional additives: IU/kg: Vit A : 18 600; Vit D3 : 1 090; mg/kg: Fe (E1): 77; I (E2): 1.9; Cu (E4): 8.6; Mn (E5): 5.8; Zn (E6): 135; Se (E8): 0.18. With antioxidants. There are currently no questions for PURINA BETA Maintenance With Chicken Dog Food - be the first to ask one!